We started planning our road trip out to Duck Creek Village to shoot Sarah and Brian’s wedding and wanted to do something different to break up our trip. After grabbing dinner with friends in San Diego a few weeks before, we decided on a camping trip in the high Sierras. The Sierra mountains is a trip we try to make once a year, and so glad we did. Here is a look at a few of our photos and an in depth look at the best way to get to the many lakes along the Kearsarge pass. Independence is the town at the very bottom where you will make your decent up the mountain to reach the beginning of the trailhead in Onion Valley. The winding road has some of the most incredible views and vista points you can imagine, it is extremely steep, but paved. We visited the camp site during the middle of October which was beautiful with tons of color change, it was nice to experience for a couple hours until we were hit with the first snow of the season. Temperatures soon dropped to the mid-teens and a full-on blizzard started around 3pm and raged into the middle of the night. If you are camping in the fall, make sure to check the forecast, as it was no easy storm to camp through. Upon waking up to a snow covered tent and campground at the Onion Valley Campground, we woke for sunrise and hit the Onion Valley Trailhead. This trail is in the John Muir Wilderness and ends at Kearsarge Pass, the boundary for Kings Canyon National Park. This is an uphill, intense 2,600 foot climb over close to 12,000. Many hikers take this trail for day hikes to the east-side lakes or even to the top of Kearsarge Pass. Others use it to access the short trail to the spectacular Kearsarge Lakes or to the beautiful Charlotte Lake, a mile past the end of the trail. Still others use it to access a segment of the JMT or as a resupply route for longer JMT or PCT routes. We met many hikers who have been hiking for several months from Canada and were making their stop into town to re-up on supplies heading all the way down to Mexico. The first section of trail is only about a mile and a half which drops you off at Lake. We had a few friends who decided to hang out here for the day, Gilbert Lake is extremely large and offers beautiful views, however we had our sights on Big Pothole Lake. From Gilbert Lake the switchbacks tend to ease in toughness. The trail flattens out quite a bit and you begin to enter a different scenery then before, taking you through more forest as you pass Flower Lake, from Gilbert to flower lake is only about ¾ of a mile. Prior to starting our trip up this is the lake we planned on camping at before we were ruddily awakened about the fact of an incoming storm which made us stay at the bottom campground. If you are deciding to camp here, it is very rocky but there are a few spots between the trail and Flower Lake that offers nice seclusion and wonderful views from your tent. The next lake up the decent is Heart Lake, and by far our favorite. Heart Lake is about a mile up from Flower, and as you get to a certain peak, you turn the corner and if you are not paying attention can easily miss it. Upon coming up to one of the switchbacks one of us turned our heads and were blown away by the glacier blue, turquoise water. We had our mind set on Big Pothole Lake, but Heart Lake stole the show. Many state that Kearsarge Pass offers some of the most insane views you kind find in the Sierras, with towering peaks and lakes in every direction and Heart Lake lives up to that. Seeing the fog crawl along the mountain tops at 12,000 feet with the deep lake perched below was truly incredible. After taking a pit stop we continued for the next decent of .75 miles to Big Pothole Lake. This was the lake we had all been raving about and eager to see. I’m not sure if the previous lakes had all of our emotions going, or we just tired after the 4-mile hike up. Nonetheless Big Pothole was stunning and now know why it received its name. It literally looks like a big pothole that has been filled with water. After hanging out for a while to regroup, we headed back down the mountain to complete the 8.4-mile round trip and go grab food. 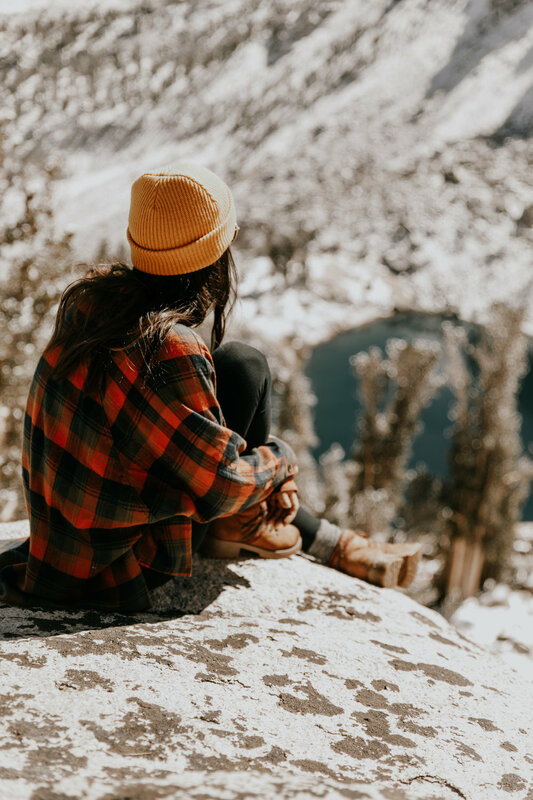 Kearsarge pass is for sure a trek to explore if you are looking for either a day trip or weekend adventure in the high Sierra’s. As always, if you have any questions feel free to reach out to ask for advice! We are Andy and Brittney. We are San Diego wedding photographers who love to capture life’s greatest moments. We live for travelling to distant places and meeting new people who share the same energy and passion for life. our objective in life is pretty simple: live to create endless memories, and wedding photography definitely allows us to do just that! Sometimes in life, it can be flat out hard to meet new people and is why we love engagement photography so much. Many of our clients have become lifelong friends with engagement shoots often leading to dinner dates and drinks. If you are eager to get out and explore and take photos in distant places, definitely hit us up! Hope to meet soon! Thinking of places for engagement or wedding photos? We would love to be a part in capturing photos for you in places like this. 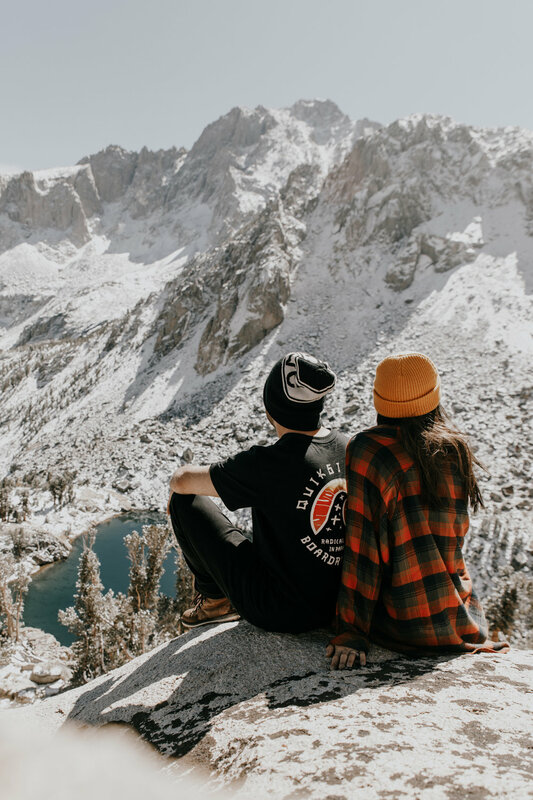 California has some of the most beautiful scenery for engagement photos and we would be stoked to share some of them with you! Whether you are out of state and looking for a destination wedding photographer or looking for a local engagement photographer we are up for the adventure. If you have any ideas or places that interest you, we would love to start brainstorming. Whether you are based here in San Diego and looking for San Diego beach wedding photographers and located in San Francisco and looking for a local photographer we are open to new locations that tell your story.